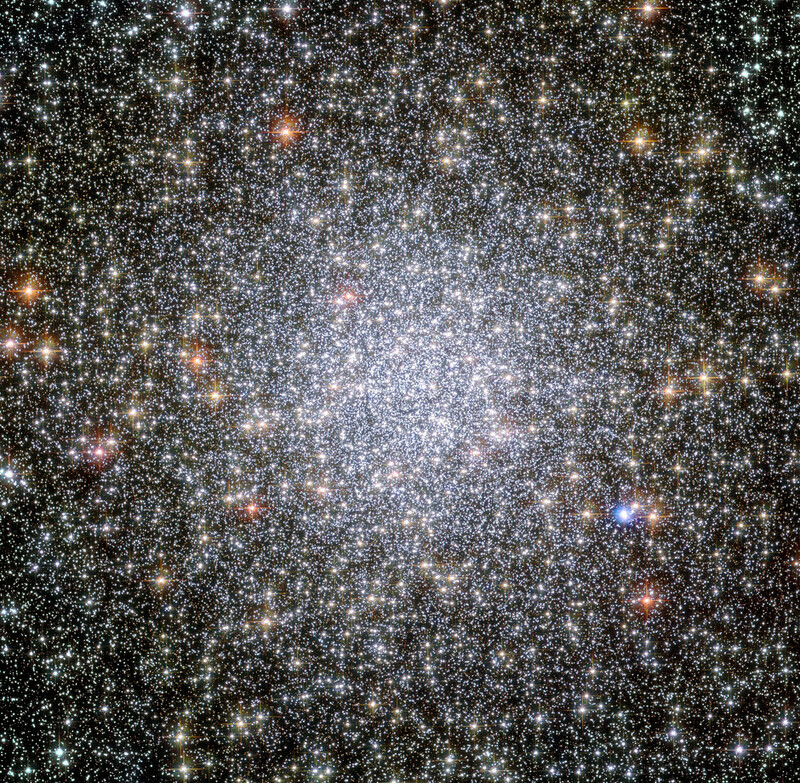 his NASA/ESA Hubble Space Telescope image shows a globular cluster known as NGC 104 — or, more commonly, 47 Tucanae, since it is part of the constellation of Tucana (The Toucan) in the southern sky. After Omega Centauri it is the brightest globular cluster in the night sky, hosting tens of thousands of stars. Astronomers have identified the orbiting companions to five millisecond pulsars in this cluster and found them all to be white dwarf stars. Image credit: NASA/ESA CC BY 3.0. When a star with a mass of roughly ten solar masses finishes its life, it does so in a spectacular explosion known as a supernova, leaving behind as remnant “ash” a neutron star. Neutron stars have masses of one-to-several Suns, but they are tiny in size, only tens of kilometres. Neutron stars spin rapidly, and when they have associated rotating magnetic fields to constrain charged particles, these particles emit electromagnetic radiation in a lighthouse-like beam that can sweep past the Earth with great regularity every few seconds or less. Such neutron stars are known as pulsars. Pulsars are dramatic and powerful probes of supernovae, their progenitor stars, and the properties of nuclear matter under the extreme conditions that exist in these stars. Some pulsars called millisecond pulsars spin much more quickly, and astronomers have concluded that in order to rotate so rapidly these objects must be regularly accreting material from a nearly companion star which in a binary orbit with it; the new material helps to spin-up the neutron star, which normally would gradually slow down. There are more than 200 known millisecond pulsars. An understanding of these pulsars has been hampered, however, by the fact that only about a dozen of them have had their companion stars directly detected and studied. Harvard-Smithsonian Center for Astrophysics (CfA) astronomers Maureen van den Berg, Josh Grindlay, and Peter Edmonds and their colleagues used ultraviolet images from Hubble to identify the companion stars to two millisecond pulsars located in the globular cluster 47 Tucanae. They were also able to confirm a previous but tentative identification, and to confirm two more. They report that each is of these companions is a white dwarf star — an evolved star that can no longer sustain nuclear burning and which has shrunk to a fraction of its original radius. Each of these pulsars spins more than 120 times per second, and the companions orbit quite closely with periods ranging from only 0.43 days to 1.2 days, close enough to easily satisfy the requirements needed for this kind of cosmic cannibalism as the pulsars gradually feed on material from the white dwarfs. The new work significantly increases the number of identified and characterised millisecond pulsar companions.